Use the form below to contact accommodation Villa Indah Manis directly. 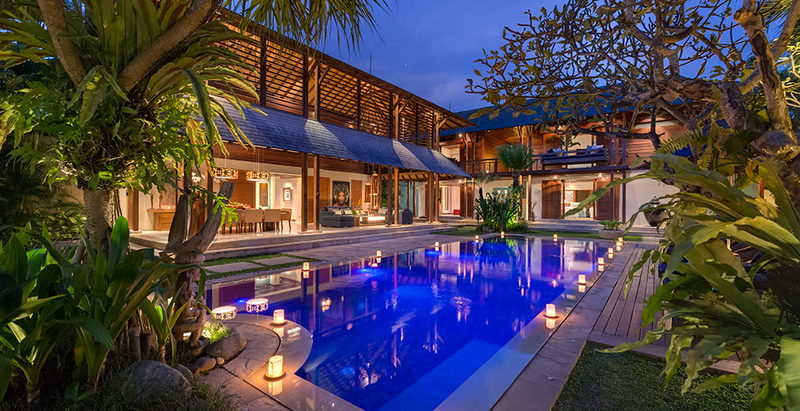 Commanding breathtaking views of Bali’s Bukit Peninsula, surrounded by charming rural landscape, and boasting colourful gardens and luxurious style, Indah Manis is an ideal choice for an event villa in beautiful Bali. 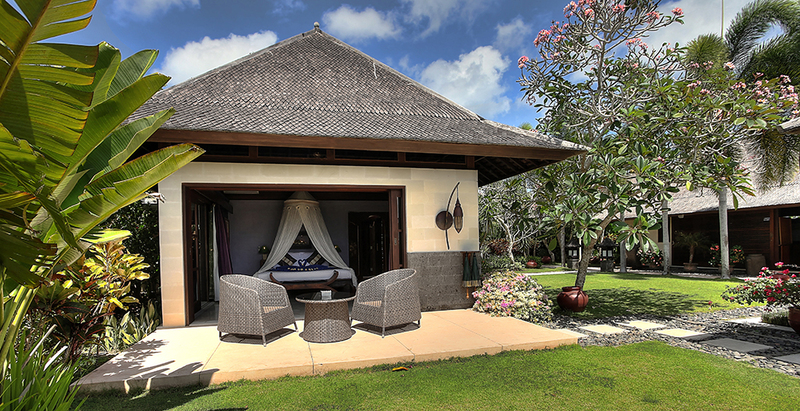 Adjoined by the self-contained one-bedroom Villa Bulan Madu – a honeymooner’s heaven with its own plunge pool – Indah Manis boasts five bedroom suites, an elegant living and dining pavilion, fitness, spa, media and games rooms and 16-metre swimming pool with shallow area for the kids. The name Indah Manis means beutifull and sweet. We hope that you will find it to be beautifully presented and delightfully palatable, imparting the sweetest of tastes. 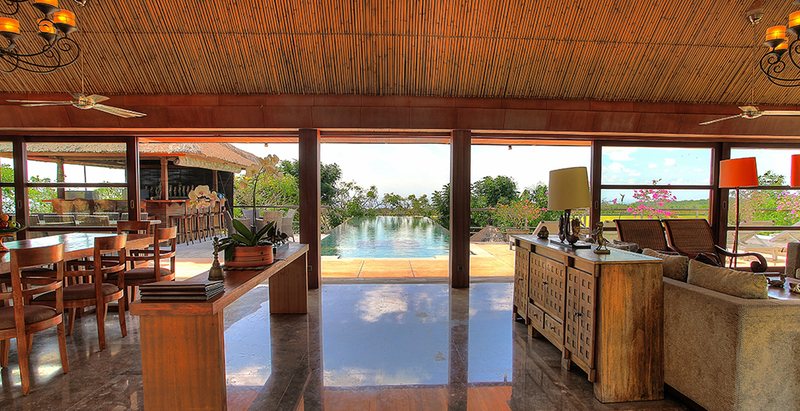 On a clear day, the awesome vista takes in the ocean, the south coast of Bali and the silhouetted peaks of distant volcanoes. This beautiful area boasts some of the most idyllic beaches in Bali, including Balangan, Dreamland, Bingin and Padang Padang. These hidden, white sandy coves are great for both surfers and non-surfers alike. The property is designed for large groups of friends and family as well as for weddings and other celebrations, and is thoughtfully built to capture the cool ocean breezes even at the hottest time of year, offering a blend of air-conditioned comfort and tropical open-air living. The villa chef and his excellent team are on hand for all meals and a full service kitchen provides facilities to cater for up to sixty guests. 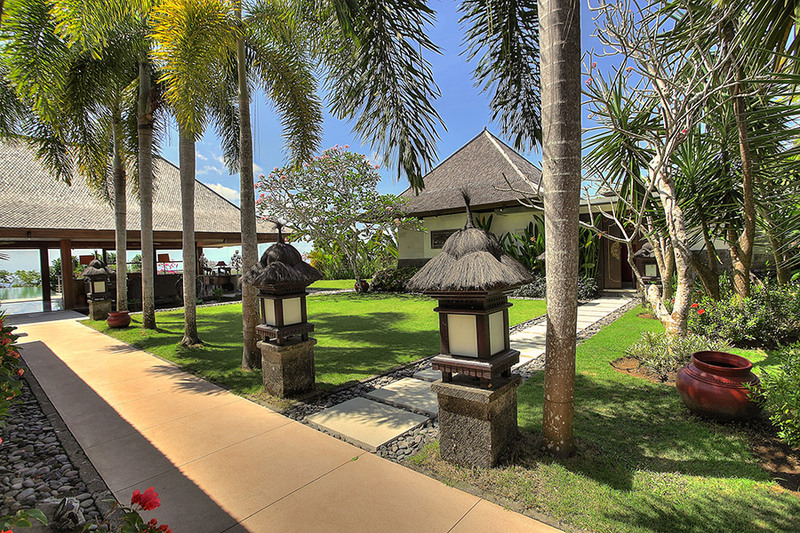 The main garden offers space for the same number of guests across its flat green lawns, while the dramatic 16m pool can be converted into a temporary dance floor or stage while all the bedrooms are housed in separate pavilions for complete privacy from the main living/dining areas.The modern Balinese architecture makes use of local materials, such as white Palimanan stone, teakwood and sandwash, together with ‘sirap’ ironwood shingle for the roofs. 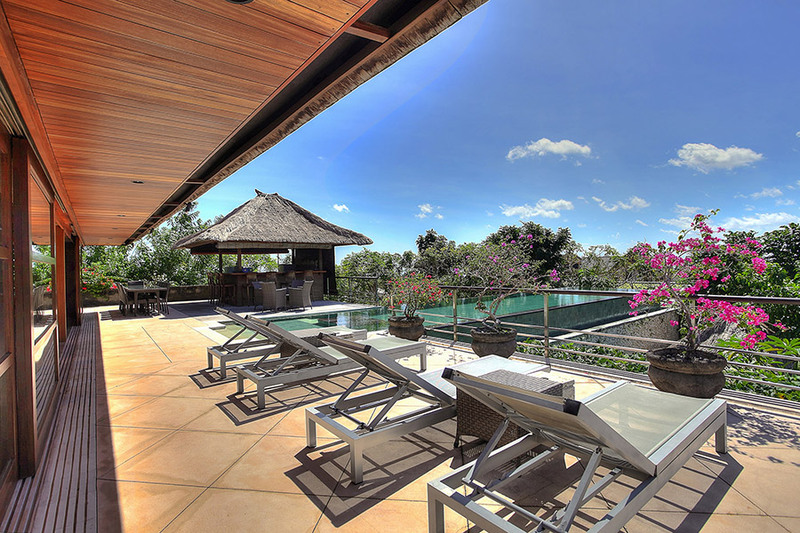 Villa Indah Manis is located far from the madding crowd, a couple of kilometres from the ocean in a rural area of Bali’s beautiful and rugged Bukit Peninsula. Amenities within walking distance of the villa are few; limited to the tiny village of Pecatu, thus the services of a car and driver are essential for guests wishing to explore. Once in the car, however, some of Bali’s best beaches are on your doorstep, as are some great restaurants, cultural activities, shops, cafes and golf courses. 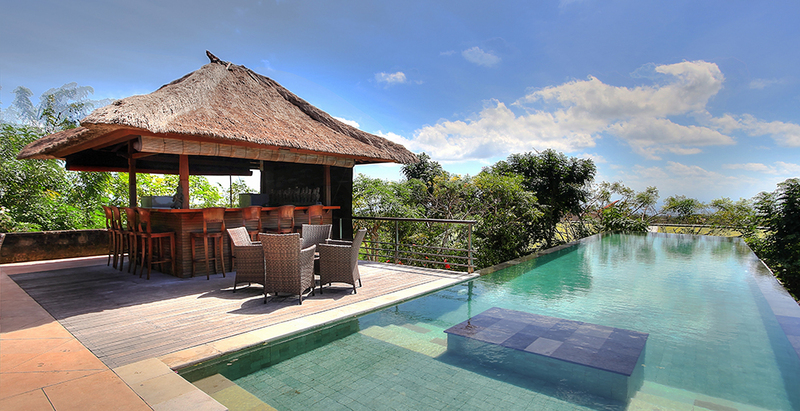 LOCATION: Pecatu, The Bukit Peninsula, Bali, Indonesia. CAPACITY: 10 adults (5 ensuite bedrooms: 3 with king-size beds; 1 with twin beds and another with twin beds convertible to queen). 4 additional kids can be accommodated in the converted annex room and in the sofa beds in one of the guestrooms; 3 extra beds available on request (extra charge applies after 10 guests). LIVING AREAS: Semi-open-air living and dining room; open-sided games room with pool table; air-conditioned media room; outdoor dining on the terrace; poolside bar. POOL: 16 x 4 metres. STAFF: 10 staff, including villa manager; chef; assistant chef; villa attendants; garden and pool maintenance staff; security. DINING: A wide variety of Western and Asian dishes. Requests accommodated (including special diets). COMMUNICATION: WiFi broadband internet access; landline telephone. ENTERTAINMENT: Surround-sound system in living pavilion; iPod dock; home theatre with movie library in media room; board games; pool table; dartboard; petanque court. 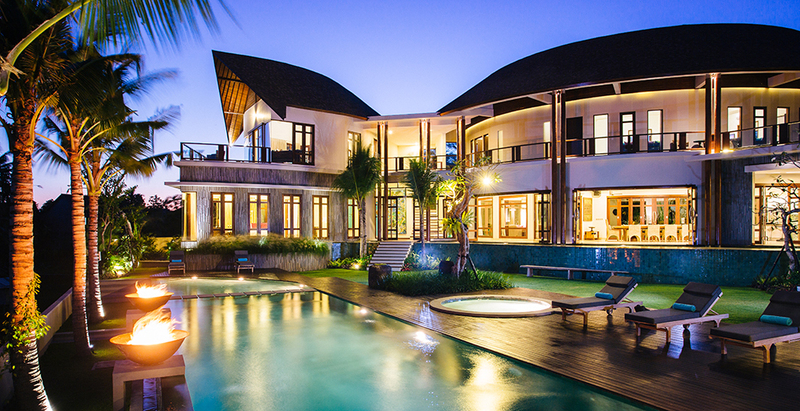 EVENTS: Indah Manis is a superb event villa. 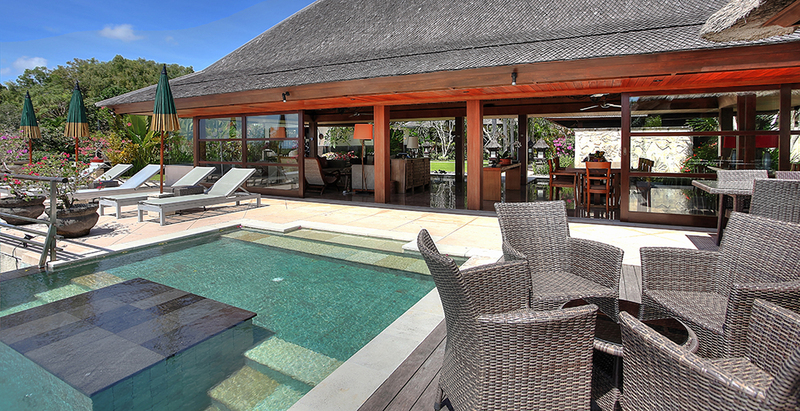 Celebrations for up to 60 guests can be arranged at the villa with prior notice. 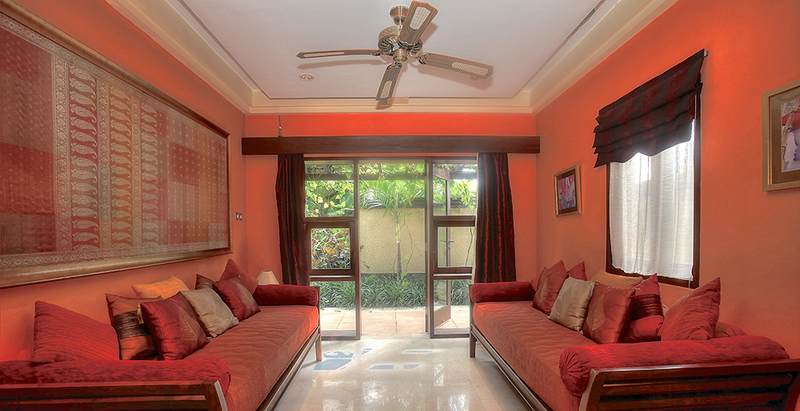 FOR FAMILIES: Villa Indah Manis is well equipped for families. Facilities include a games room stocked with board games and movies, high chair and cot, and a special shallow area in the pool. TRANSPORT: Car and driver available for 8 hours at a special rate of USD25++/day (excludes petrol). ADDITIONAL FACILITIES: Full back-up diesel powered electrical generator. GYM AND SPA: Fitness room equipped with exercise bike, step trainer and dumbbells. Spa room with jacuzzi tub, massage beds and chairs. 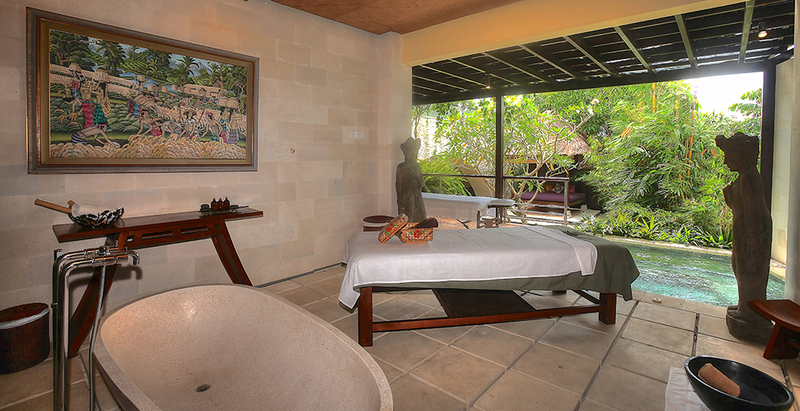 One complimentary 30-minute back and shoulder massage (for up to four people). 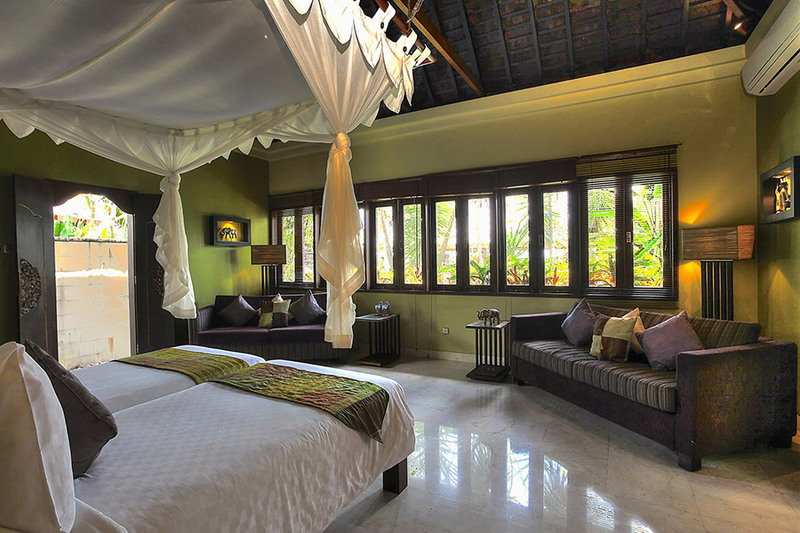 Last minute bookings enjoy 10% discount when checking in the next 10 days. .
A small fishing village located within a beautiful sandy bay of Jimbaran on the southern Bukit peninsula. 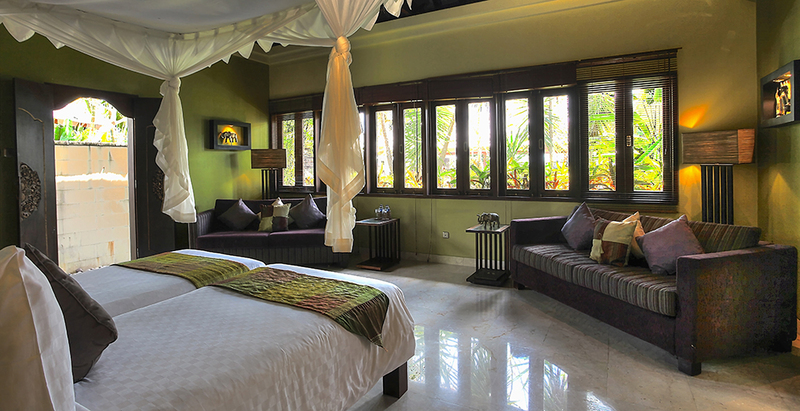 The few accommodations here range from basic losmen to world class luxury hotels. Jimbaran is the realm of luxury hotels, the likes of the Four Seasons Resort at Jimbaran Bay and the InterContinental Bali Resort & Spa. The pristine white sand beach is protected by a reef and has few waves, making it ideal for families with young children. A significant part of the beach is lined with restaurants offering the day’s catch at reasonable prices–fresh from the fishing fleet of nearby Kedonganan. Many day-trippers choose to make this the final stop of their journey in order to enjoy Bali’s best seafood assortment while lapping up another spectacular sunset. Jimbaran has an increasing number of rather chic shops but there is little or no nightlife here. 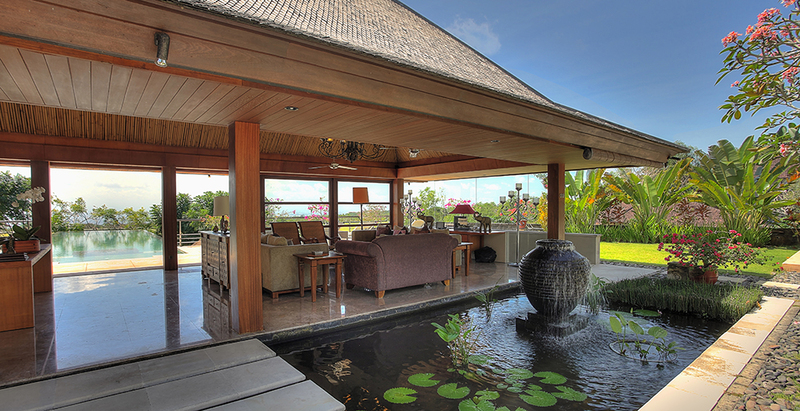 It has the advantage of being a little closer to Kuta and Seminyak and the cultural highlights of Central Bali. The beach of Jimbaran Bay is famous for its tranquil waters (a true luxury in Bali, known for unforgiving waves and cruel back currents), soft velvety sand and scenic sunsets. 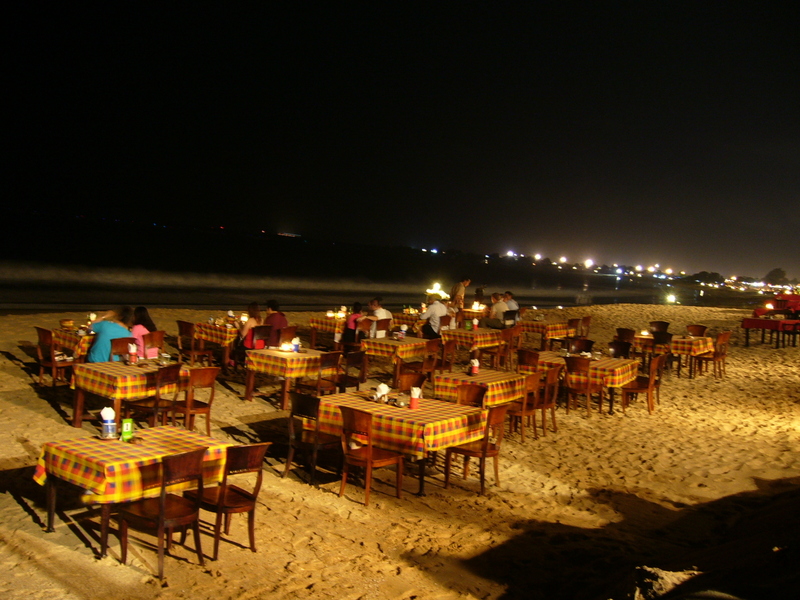 Eating seafood on the beach in Jimbaran is a quintessential part of many a visitor’s itinerary when coming to Bali. 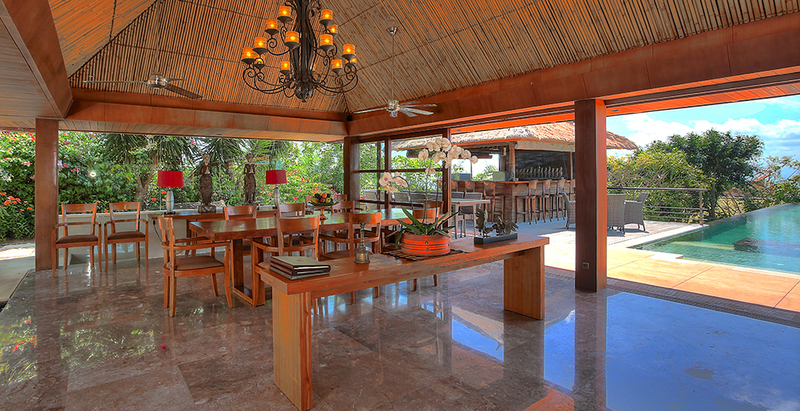 Jimbaran Bay is home to about fifty grilled seafood restaurants in three different groupings, all set along the beach. The three sections are Muaya (in the very south), Kedonganan (in the middle) and Kelan (north of the fish market). Each of the restaurants is much of a muchness and of the groupings, the most southerly closest to the Four Seasons is the most popular these days. Tables are set up right on the sand and if you sit at the lowest tables at high tide, you can even get your feet wet. The sea breeze is cool, the sunsets are beautiful and the whole area is lit by oil torches after dark. 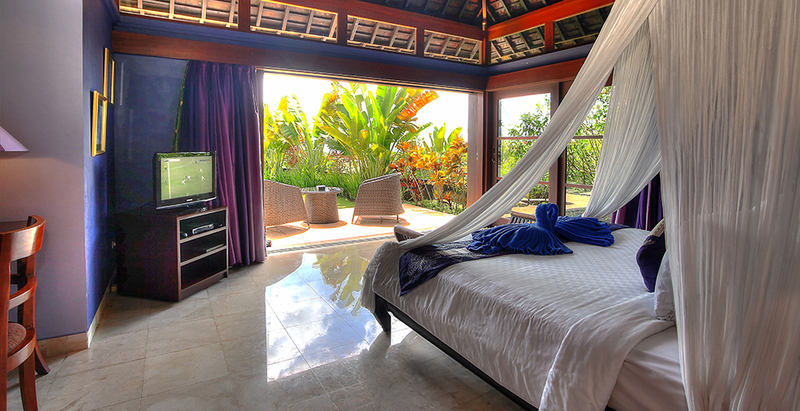 Zoom in and get the best rates for your hotel at Jimbaran Beach! 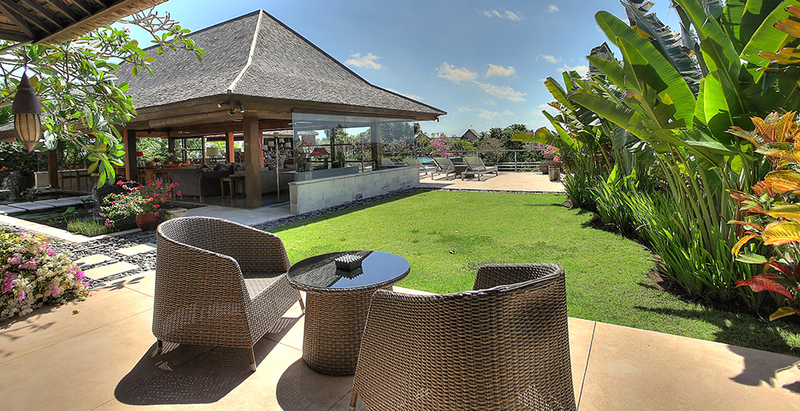 The beach, Jimbaran Bay is fringed by one of the best beaches in Bali. 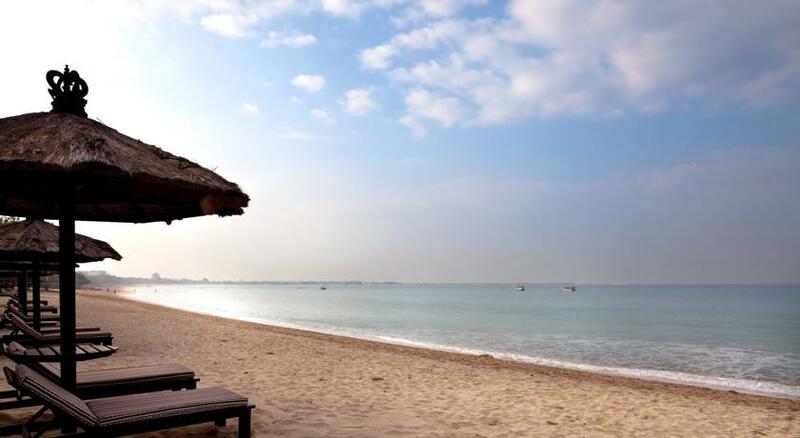 The sand is fine and white, and the calm waters make it very suitable for swimming, children and adults alike. The southern end of the beach close to the Four Seasons Resort is the quietest but the whole stretch is very pleasant indeed. Any dreamy day in Jimbaran could end watching the sky morph from raspberry to lavender while strolling by the sea, but for something unique, we suggest having a few lazy laps in the Olympic-size, Versace-style pool of Sundara Beach Club. 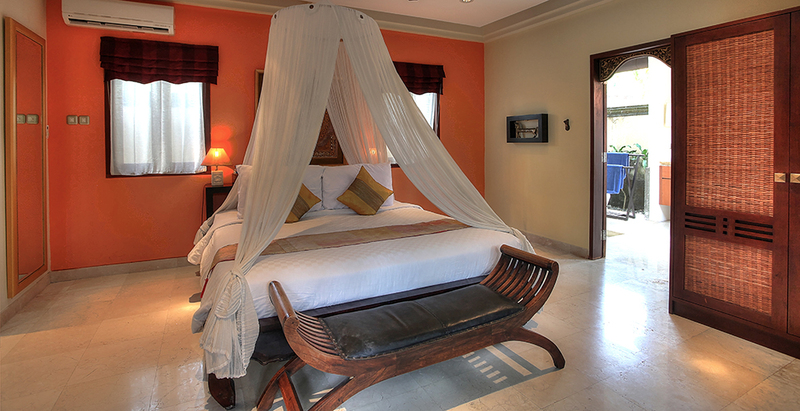 Owned by the fab Four Seasons Hotel, the Sundaara Beach Club is the epitome of luxury. Thankfully for those who can’t afford to check-in, it’s open for the public to come and enjoy. Sit back at one of the chic cabanas toasting icy Wasabi Martinis to the descending planes beside you; if those folks in the air could see you, they’d know that torturous flight was worth it! Garuda Wisnu Kencana Cultural Park, often referred to among locals by its acronym ‘GWK’, is a multipurpose open-air site and covering 250 hectares in the hills of Ungasan, several minutes’ drive up from the main Jimbaran area. New Kuta Green Park is a fun zone and a great leisure destination for the whole family, covering five hectares filled with a variety of pools, slides, lazy rivers and a range of outdoor activities. This water park is a short drive from the Dreamland Luxury Villas & Spa and only a few hundred meters from Bali’s famous Dreamland Beach. Fish Martket Jimbaran - Jimbaran Bay, originally a fishing village, is now home to a traditional wet market where most of the fresh catches are sourced from in southern Bali. The main market is located in Kedonganan, several hundred meters north from the main Jimbaran coastline, with the western runway of the Ngurah Rai Internatoinal Airport in sight. Dreamland Beach was the first surf spot and ‘hidden’ beach to rise to fame on Bali’s southern Bukit peninsula. This was before its 400 or so hectares were opened to allow for the development of the Pecatu Indah Resort megaproject. Now open to the public, and dubbed ‘New Kuta Beach’, it still is home to some of the best reef breaks on the island, and continues to attract advanced wave riders from the world over. The "must do" is to get to Jimbaran Bay is to pick a seaside restaurant (some bargaining is allowed) and watch the sunset while your seafood is being BBQ'ed. The highlights of dining at this beachside food-court are endless: you can pick your snapper, clams, crabs or the whole lobster at the stall, playing the seafood pro and assessing the freshness of the daily catch. Then dip your toes in the sand (or even in the water as some tables are close enough to the sea, but beware of the rising tide!) and soak in this barefoot bliss, stuffing yourself with the grilled underwater goodness. The "must do" is to get to Jimbaran Bay is to pick one of the arround 30 seaside seafood restaurant (some bargaining is allowed) and watch the sunset while your seafood is being BBQ'ed.